This blog was transcribed from one originally written on a typewriter. You can read the original here. I’ve wanted a typewriter for some time now and didn’t know why until I finally managed to nab this one off E-bay. It is a very old, pre-electric model which means that writing on it is rather more physically demanding than a computer keyboard. I have to hit the keys with enough force to propel the letters onto the ribbon to make an imprint. And whilst I had a romantic memory of typewriters, I have to admit that the reality is a little more arthritis inducing than I remembered! But, even though there are downsides, the upsides are inspiring and seem to encourage a subtly different form of creative expression. Mistakes are inevitable and, at the same time, commitment is essential. If I don’t totally commit to hitting the keys hard enough then I cannot convey my thoughts. But if I hit a wrong key, or hit two at once, the mistake is irreversible (in the pre-tipex world at least) This beautiful tension between commitment and error feels like a different form of writing to normal. 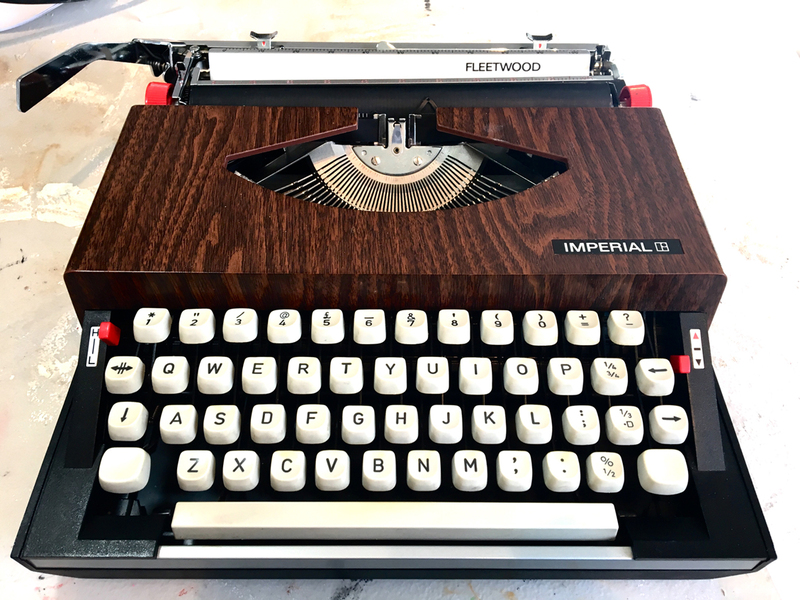 As I type I have a different focus, a different connection with the physical sensation of typing, the sound of the keys and the bell, the physical and spatial act of returning the carriage at the end of the line. It even smells different. I am only noticing these as they are typically absent from writing on a computer. Whilst digital brings us a lot, I wonder what we have left behind? I have an old copy of the Beatles album Rubber Soul somewhere in the attic/loft. I can’t help but recall the smell of that dusty old second hand record when I see the picture on the cover. Yet, somebody who has only ever listened to it digitally will not have had this experience. Nor that of physically cuing up the record and hearing all the noises of the needle moving into place. When artist and musician Daniel Johnstone recorded his seminal first album “Hi, how are you?” he didn’t have a way of replicating the tapes so he simply played the entire album from start to finish over and over again each time he wanted to make another copy to give to somebody. Hard work but it means that every one of those early copies is absolutely unique. It seems to me that I have traded something important in my move to digital in a way that was so gradual that I didn’t notice. I have taken convenience, reach and the ability to share far and wide and relinquished the sensual, physical and (as I reach the end of this blog) somewhat draining experience of analogue. I’m not making either bad. Am simply excited at the creative potential that I am experiencing through getting to know my new typewriter. The two can co-exist as I will now scan this in and share it digitally. And I wonder how this will read compared to my normal blog, having not re-read it before publishing.